Some of the world’s largest and most influential companies do business in Georgia. They are critical to the economy, revving the engines of innovation and providing jobs to millions. But if discriminatory so-called “religious freedom” bills become law, the economic fallout could be catastrophic. State agencies have estimated that our state would lose billions in revenue to the tourism industry alone. Highly-innovative, highly-profitable companies are already threatening to leave Georgia in favor of states that don’t discriminate. And entertainment insiders have said the industry—competing with cutting edge places like Los Angeles and New York—would all but bottom-out. In short, Georgia businesses are concerned, and they’re speaking out. Salesforce lists Atlanta among its top-5 U.S. employment centers and is one of Georgia’s fastest-growing tech companies. If it divests from the state because of unnecessary and discriminatory so-called “religious freedom” legislation, hardworking Georgians will bear the brunt of the burden. Delta employs more than 30,000 Georgians and makes Atlanta a major travel hub. Again, who would pay the price for state-sanctioned discrimination? Hardworking Georgians, tens of thousands of whom will be out of work if Delta leaves the state. The corporate leadership of Unilever, Virgin Airlines, Dell and Microsoft have also raised their voices against these discriminatory bills. Georgia’s hospitality and tourism industry, which has a $53.6 billion economic footprint, is also strongly against these so-called “religious freedom” bills. Starwood Hotels & Resorts, which owns 17 Georgia hotels, recently wrote a letter to Governor Nathan Deal urging him not to sign any bills that would allow businesses to discriminate. Atlanta’s Dragon Con festival, which draws more than 70,000 visitors annually, has vowed not to work with any business partners that discriminate. Grant Hill, co-owner of the Atlanta Hawks—which brought in $30 million in tickets last year—has also spoken out against FADA and RFRA. Just earlier this year, Governor Deal pushed for tax credits to the tune of a quarter billion dollars to fund Georgia’s film industry and help build the state’s brand as the Hollywood of the south. He justified the astronomical investments by citing the number of jobs the industry would create and the influx of new revenue to Georgia’s economy. If lawmakers pass anti-LGBT legislation that causes the film industry to divest from Georgia, not only will much-needed jobs and revenue be slashed, taxpayers will be out the quarter billion dollar investment that Governor Deal promised would pay off. In short, Georgia companies across a diverse range of industries clearly fear so-called “religious freedom” legislation. Bills like FADA and RFRA make our state look like a risky place to do business. They make us look unwelcoming to talented entrepreneurs, employees, and companies who might be thinking of expanding or relocating. Every day that legislators continue to consider writing discrimination into Georgia’s laws, they are are putting our economy at severe risk. 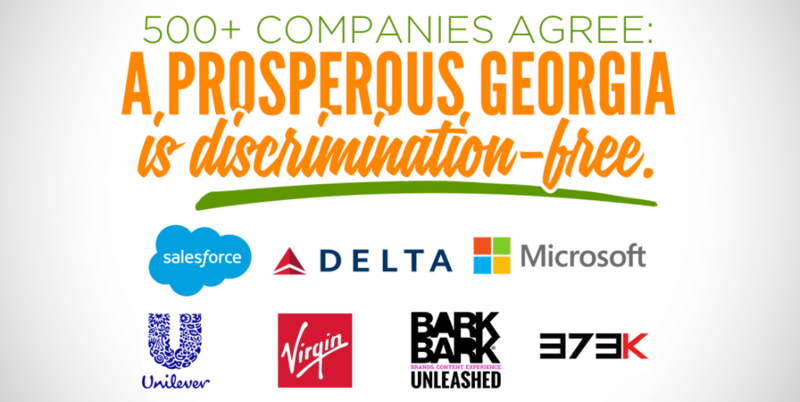 More than 400 companies—including Fortune 500 heavyweights like Delta, Coca-Cola, and Home Depot—have joined Georgia Prospers, a coalition making the business case for inclusion and diversity as cornerstones for economic prosperity—and denouncing state-sanctioned discrimination. If you are a business owner and you oppose LGBT discrimination, click here to join the Georgia Prospers business coalition today.